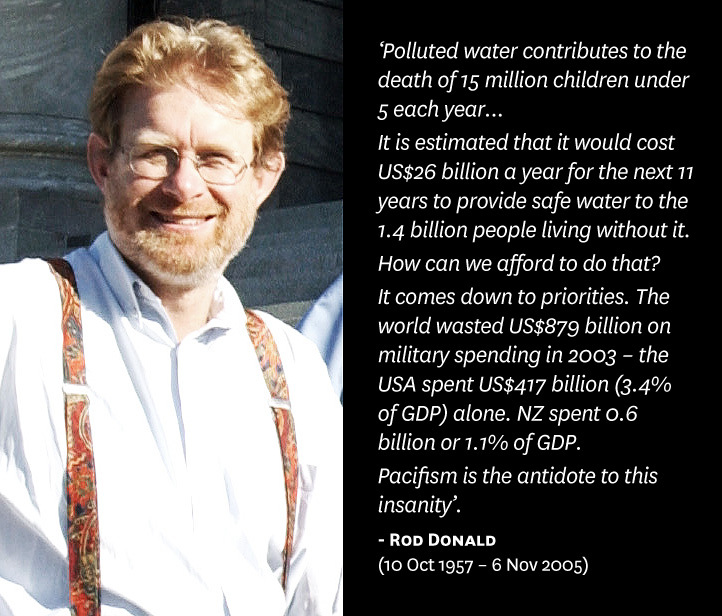 Environmentalist, politician and peace activist, Rod Donald was a respected member of Parliament and co-leader of the Green Party until his sudden death in 2005. Dedicated to offering an alternative politics which did not rely on war or oppression to control and order international relations, Donald spoke often about the importance of peace, and the need for every member of society to work towards achieving it. As he said in his speech to Parliament marking the dedication of the Tomb of the Unknown Soldier, ‘It is not enough to acknowledge the futility and obscenity of war. For the sake of all those who died and all those families and friends who lost their loved ones we must all strive to overcome the causes of conflict and build a peaceful world’. As well as making speeches, Donald was an active protestor, taking part in the Anti Bases Campaign from 1997, attempting to close the Waihopai spy base near Blenheim so that Aotearoa New Zealand was not supporting United States wars through intelligence gathering. At the Riverside Peace Festival in 2005, Donald said, ‘I would like to acknowledge those who founded Riverside as a Christian Pacifist Community in 1941 and those early members of the community who were put in detention camps during the Second World War because they were conscientious objectors. They had amazing foresight, tremendous determination and, most of all, the courage of their convictions. What we enjoy here today is because of their hard fought struggle – not just the physical deprivations and exhausting work of the early years but also the social ostracisation they suffered. Our generation owes the conscientious objectors to both world wars a particular debt of gratitude. Without their sacrifice it would not so easy for us to campaign for peace today. For Donald, his message of environmental responsibility was directly tied to his struggle for peace. In his Riverside Peace Festival speech Donald said that ‘Right now between 1.1 and 1.4 billion people on this planet do not have access to safe drinking water, including 36% of the population of Africa. Polluted water contributes to the death of 15 million children under 5 each year. In addition to the disease burden, women and children in developing countries are particularly affected by the lack of access to safe water as the task of carting water, often over long distances in rural areas, usually falls to them. It is estimated that it would cost US$26 billion a year for the next 11 years to provide safe water to those 1.4 billion people. How can we afford to do that? It comes down to priorities. The world wasted US$879 billion on military spending in 2003 – the USA spent US$417 billion (3.4% of GDP) alone. NZ spent 0.6 billion or 1.1% of GDP. Pacifism is the antidote to this insanity’.